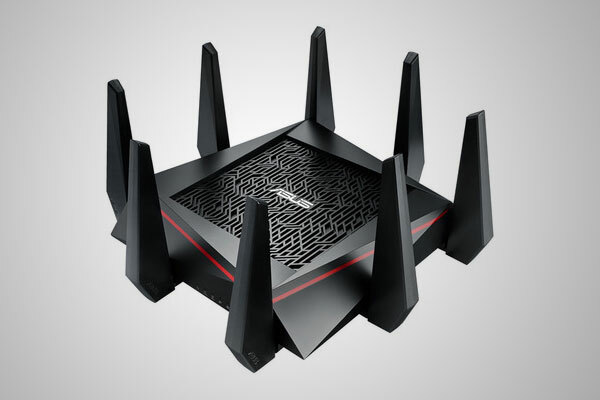 The Asus RT-AC family of high end routers pushes that boundary with every release, and the RT-AC5300 “Alien Spider” is a shining example of what can be done when “overkill” is not a criticism, but a design goal. When I took the 25-25cm AC5300 out of its box the first thing I worried about was where I was going to put it. This thing is huge, it weighed nearly 2kg! 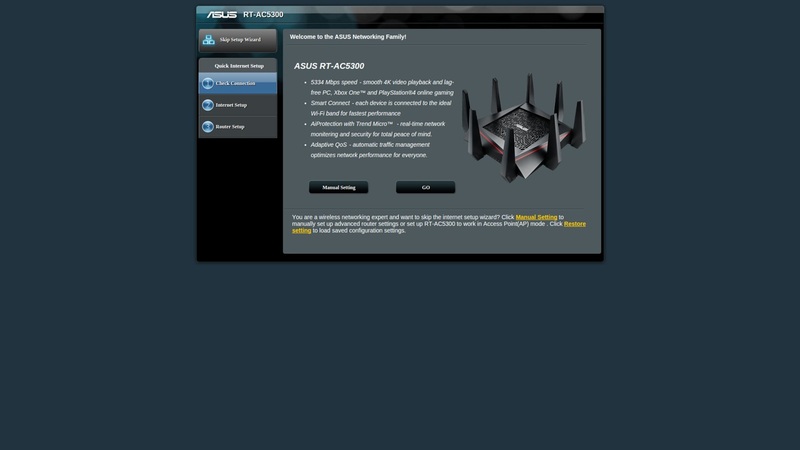 There are no half measures here, this router is meant for the modern connected home with multiple Wi-Fi connected devices. 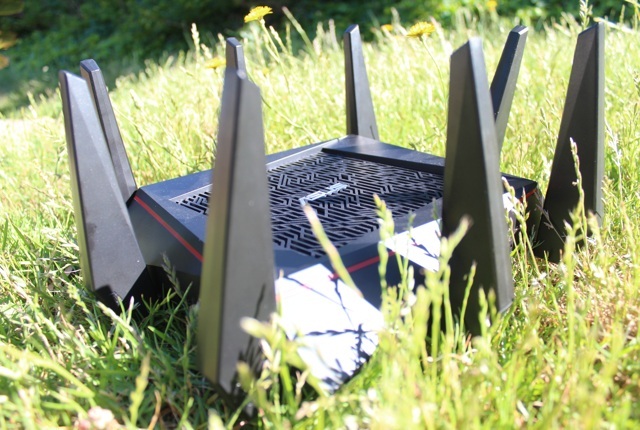 If you are a technophile family who has a smart TV, gaming console(s), tablets, phones, and laptops, this router is for you. With tri-band connectivity that boasts a claimed 1Gbps on 2.4GHz, and 2.1Gbps on 5GHz, you will have to go far to max out the data throughput on this device. It is not all about the Wi-Fi though, even if the freakish eight antenna design screams “Wi-Fi for all!” There are four gigabit RJ45 ports, a dedicated WAN port and two USB ports. 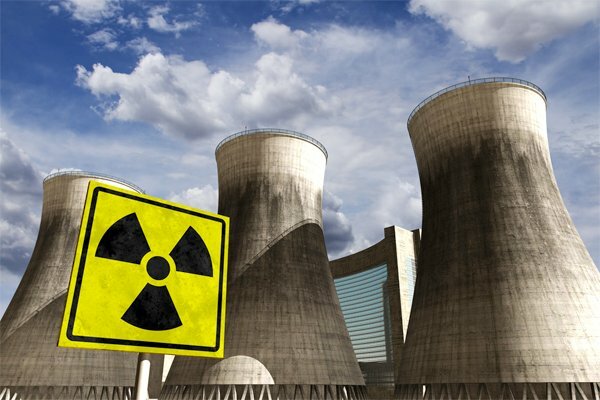 More than that, the real power of the device comes with the firmware which has the ability to turn your house into a fully connected home. It offers network monitoring, a file server, cloud file sharing, parental controls, a media server, QA, a guest network, and a print server, among other things. There are also more mundane features such as switching the RT-AC5300 between being used as a wireless router, or access point. To find anything I disliked about the RT-AC5300 I had to reach hard. The size and looks of the thing is not entirely to my taste. I had to clear a part of a desk to position it, and it looks chunky. With a recommended retail price of R6,999, the price is on the premium end of the market as well. In truth, I really can’t fault it at all. It easily covered my home with better than acceptable wireless access, even in areas where I usually had no coverage with other routers. Throughput was always as much as my client devices could handle. The build quality is generally excellent, but the Wi-Fi antennas tended to be a bit wobbly on our test unit. At least one of them was decidedly loose on the inside, but since this is a well-traveled review unit it is entirely possible that the loose antennas is due to review mileage. I connected an Asus EA-AC87 to it to test raw Wi-Fi speed, and took the longest power lead I could find and went on a walkabout. From 25meters outside our house with the AC5300 on the opposite end, we still managed a sustained throughput upwards of 750Mbps. Impressive, to say the least. If you are in an area that gets fiber to the home, this is the router you must have to make the most of it, especially since the WAN port is also gigabit capable. Should you be lucky enough to ever get Gigabit fibre you will always be able to use all of it. Excellent Wifi Penetration and Speed It is very big. Most people probably won’t mind the size, though.